Exploring body and place in ways that are expansive, intimate and playful, Viva the Real celebrates resilience and continuity in everyday life. Jones' poems offer us a strong, vital voice, charged with her effortlessly rhythmic and resonant lyricism. This collection is both haunted and visceral, and will resonate long after reading. 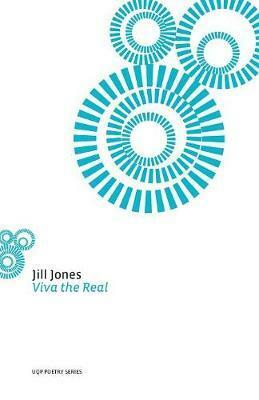 Jill Jones was born in Sydney and has lived in Adelaide since 2008. She has published ten full-length poetry books and a number of chapbooks, including The Beautiful Anxiety, which won the Victorian Premier's Literary Award for Poetry in 2015, and Breaking the Days, which won the Whitmore Press Manuscript Prize in 2014 and was shortlisted for the Kenneth Slessor Poetry Prize in 2017. She has also won the Kenneth Slessor Poetry Prize and the Mary Gilmore Award. Her work is published widely in Australian and international anthologies, magazines and periodicals, and has been translated into Chinese, Dutch, French, Italian, Czech, Macedonian and Spanish. She has worked as a film reviewer, journalist, book editor and arts administrator. In 2014 she was poet-in-residence at Stockholm University. She currently teaches at the University of Adelaide where she is also a member of the J.M. Coetzee Centre for Creative Practice.